The material aesthetics of abundance. Whole Foods is an ingenious space whose allure may have much more to do with attention to idiosyncratic but critical material design details than it has to do with organic food politics, liberal causes, or resistance to pesticides. For those who have not done ethnographic fieldwork in one of these upscale grocery chains, Whole Foods Market focuses on natural and organic foods and announces that “our goal is to sell the highest quality products that also offer high value for our customers. High value is a product of high quality at a competitive price. Our product quality standards focus on ingredients, freshness, taste, nutritive value, safety and/or appearance.” The most prominent player in the $1.3 billion market niche of upscale natural grocerychains, Whole Foods Market has just over 310 stores in 38 states as well as the UK and Canada. There has been significant attention paid to these upscale markets focused on, for example, where they decide to place stores, fair trade groceries, and even how to shop Whole Foods on a budget. Nevertheless, few academic observers seem to have examined how the material spaces themselves shape the upscale grocery shopping experience. The rare and most thoughtful exception is the prescient analysis of Greg Dickinson and Casey Malone Maugh, who analyze how competitor Wild Oats engages “a full range of embodied senses” in which “tasting, smelling, touching and looking lead to choices that involve the whole person.” (Whole Foods agreed to purchase Wild Oats in 2007, but the market niche of premium natural foods hawked to the bourgeois was deemed sufficiently distinctive by the Federal Trade Commission that the merger was squashed in 2008.) Dickinson and Malone do not wield archaeological methods to assess the Wild Oats experience, but they clearly have an archaeological sensibility when they assess how such upscale groceries fabricate an air of “abundant simplicity.” I rarely frequent Whole Foods because, as Marge Simpson has said so perceptively, “we can’t afford to shop at any store that has a philosophy.” Given the expense of buying more than a handful of specialty items at Whole Foods, it is not a common grocery choice for all but the most committed or wealthiest consumers, but today I rationalized it for convenience and ethnographic research. 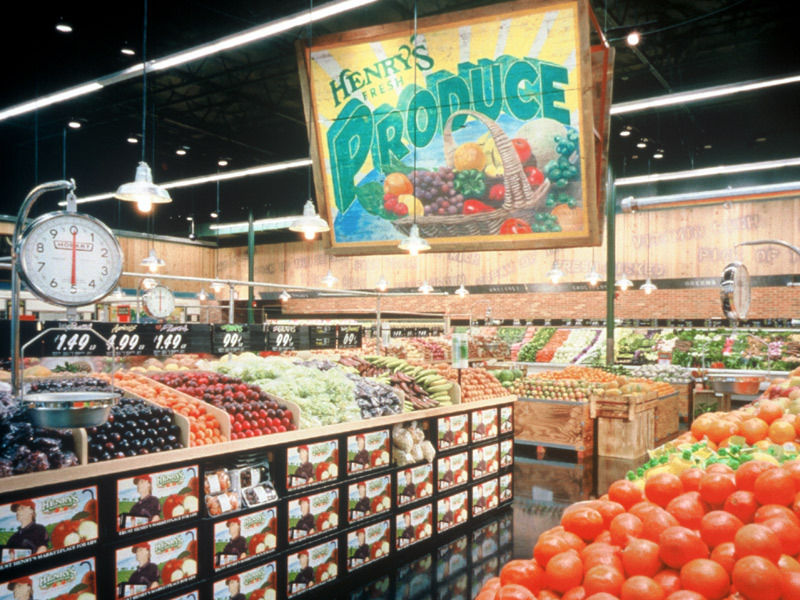 Dickinson and Maugh argue that markets have long been uniquely public social spaces, but most grocery stores are today sterile chain designs, indistinguishable from the ocean of heartless Walmarts and strip malls that seem to have no connection at all to local communities. In contrast, Whole Foods is an absolutely compelling consumer space for several small but critical material reasons. First, Whole Foods smells absolutely fabulous, and perhaps they really can celebrate that this deep rich and distinctive smell is a concrete confirmation of the difference between these foods and the mass farmed foods in Kroger’s. Whole Foods and similar organic stores tend to smell even more powerful than real outdoor markets because the aromas sit in grocery stores but are dissipated in the open air. 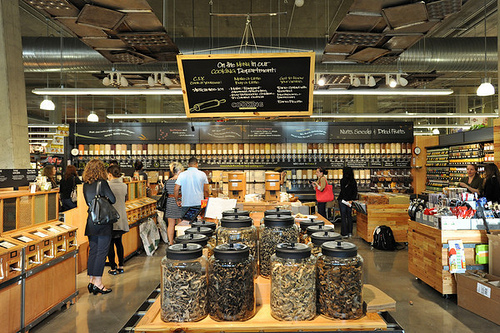 Whole Foods is a wave of rich food odors that play out as shoppers move from vegetables to fish to the deli and on to the fromagerie, an experience much like the finest European groceries. Whether aroma is truly “material” is perhaps a semantic issue, but it is difficult to separate the material experience of a fine restaurant—or a heaping garbage pile—from the perceptions of odor. Second, Whole Foods is remarkably colorful. The grocery’s astoundingly well-organized cases of pre-packaged fruits, fruit juices, and mysterious vegetables burst with colors that rarely occur in a major grocery chain. The colorful products, mysterious brands, and text-rich labels explaining the philosophical merits of this particular good make for an especially compelling experience for a consumer who enjoys that sustained desire and the contemplation of things. The aesthetics are absolutely critical, because I admit I found myself magnetically drawn to contemplate some products in aisles that I had no reason to even consider. This is very different than shopping from a list in WalMart or rushing to the freezer at 7-11 for butter, because it aspires to empower a consumer with the sense they are thinking through their choices and assessing a breadth of factors, and that is very much a bourgeois, educated consumer pattern. Whole Foods is not the place to go for class diversity, but it appears to ensnare everybody with a graduate or professional degree. Any doubts about the compelling aesthetics of Whole Foods s are laid to rest by the surprisingly large number of pictures of Whole Foods, Wild Oats, and other upscale markets posted online on pages like flickr. An enormous amount of photographers choose Whole Foods as their subject and bypass the more prosaic Krogers and Safeways that have become almost invisible to most consumers. We do not really see or think much about mundane grocery spaces and similarly routine public spaces that have become so familiar that they are rendered essentially invisible. But Wild Oats, Whole Foods, and similar chains like Trader Joe’s and Sprouts have identified a material aesthetics that is distinctive and visible and captures aspiring photographers even as it targets the desires of a particular range of consumers. Michael Serazio’s 2011 analysis of Whole Foods reaches a similar conclusion that “increasingly articulate values and identity have become grafted onto” an otherwise banal shopping experience in such chains that reach beyond “niche margins to mainstream consciousness” and champion ethical consumption. Serazio says such spaces and their sales appeals step beyond normal branding, arguing that such “ethos groceries may well represent the next stage of branded products – defined as capturing the moral character, spirit, or imagination of a culture which, in this case, seeks to be bourgeois, bohemian, and baby boomer all at once.” Michael Powell’s thoughtful contribution to Savage Minds examine a range of scholars who do “shopper marketing” and use the ethnographic and material tools of anthropology to assess and shape that most unpredictable of all things, consumer desire and behavior. At the end of this we are still compelled to ask how that material experience masks Whole Foods’ fundamental desire to maximize profit. Whole Foods aspires to evoke a sense of locality and community while it hawks goods from well outside the neighborhood, and identifications of the place from which various foods were grown attempts to construct a contrived sense of the local that evades all the inequalities in the chain of production that brings grapes to my Whole Foods. 2004 Placing Visual Rhetoric: Finding Material Comfort in Wild Oats. In Defining Visual Rhetorics, eds Charles A. Hill, Marguerite H. Helmers, pp.259-276. Lawrence Earlbaum: Mahwah, New Jersey. 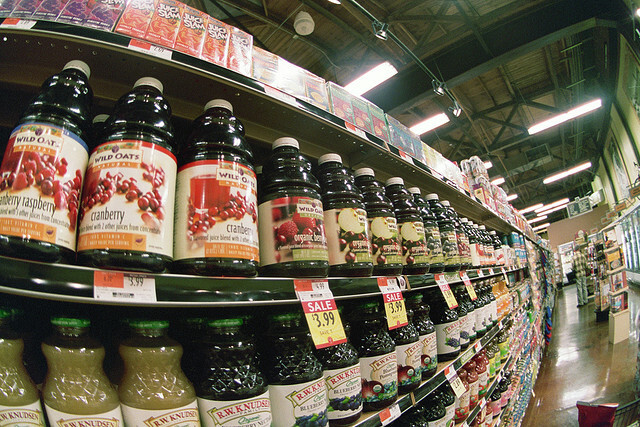 2011 Ethos Groceries and Countercultural Roots: Consuming Memory in Whole Foods’ Brand Utopia. The Journal of Popular Culture 44(1). In December 2011 the Lumina Foundation report Hard Times: Not All College Degrees are Created Equal inventoried the employment prospects for various college degrees, and they soberly recognized that “unemployment for students with new Bachelor’s degrees is an unacceptable 8.9%.” They found that Anthropology and Archaeology graduates had an unemployment rate of 10.5%, so this has created some hand-wringing in archaeological circles and unleashed some hollow political rhetoric from a variety of fiscal conservatives, anti-academics, or critics of socials sciences and humanities. The situation is perhaps not as dire as some observers believe, and archaeology is not simply an indulgent pursuit of a handful of dry scholars, but there certainly are some shifts worth understanding for those who wish to become archaeologists. The Lumina report is actually pretty even-handed and dispassionate about sober realities. For instance, they acknowledge that “graduate degrees make a quantum difference in employment prospects across all majors,” and in Anthropology and Archaeology students with graduate degrees had an unemployment rate of just 4.1%. Certainly archaeology students who wish to work for Cultural Resource Management firms or state and federal agencies should always anticipate securing a Master’s degree, because the employment for undergraduate degreed students simply is not substantial or predictable. A Master’s program provides an opportunity to develop concrete skills like Geographic Information Systems, artifact conservation, database management, or oral historical interpretation that are not afforded in comparable depth in an undergraduate experience. Nothing could be further from the truth, but there are ways to prepare thoughtfully to ensure an archaeology student will be employable when they leave school. First, a Master’s degree is almost essential in the present job market, and it simply makes for a much more solid scholar. Second, there is still an enormous amount of compliance archaeology in the US, but many smaller firms have folded, so the chances of securing a job exactly where you are is probably idealistic. Graduates may well be required to move to a new place, and they likely will do a fair amount of traveling from one contract site to the next. Third, some observers will never embrace a liberal arts education that yields a reflective and broadly based thinker, as opposed to somebody who emerges from the academy with a series of technical skills. Philosophically, the academy trains students in liberal arts, sciences, and professional schools to think and can’t simply be reduced to job training labs. People show up at my office regularly indicating they have always been utterly fascinated by archaeology: some come after a career in an ostensibly productive major, others are current students who are unhappy in one of those majors that would supposedly yield them a job one day, and a few are taken by the discipline after a class, but they almost universally are responding to their own deep-seated desire to simply be an archaeologist. I am always sober and critical and remind them that being an archaeologist requires an exceptionally broad training and may not look just like it did on their favorite television shows. I would never tell them what I do is not fabulous fun and fascinating, but I spent a very long time in school, I need to know some challenging science as well as some popular culture, I spent many months away from home, and I went on plenty of excavations that were frankly kind of boring. Some of those folks do decide that its fine to go on an excavation some summer but it may not really be a career appropriate for them. But for others they can have their mid-life crisis now and live the life they want to live provided they realize the challenges of this path. That may be “silly idealism,” and shallow observers can reduce the discipline to “useless,” but the goal is to have students who are fulfilled and contribute to broader communities, and on that count archaeology has a very good record. 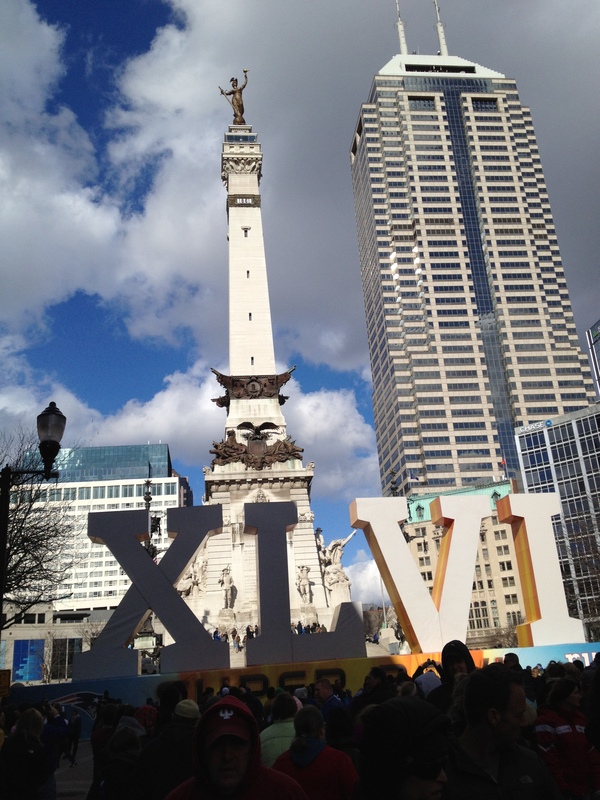 During the 2012 Super Bowl, the Soldiers and Sailors Monument in the background lorded over the proceedings. In 1897 German sculptor Rudolfo Schwarz was commissioned to complete “War” and “Peace” statuary groupings for placement on the eastern and western sides of the monument respectively (Modupe Labode’s Monument Circle Project has lots of historic images of the monument). Nestled at the base of the Peace side is the emancipated African American, kneeling and holding up broken chains toward the female figure of Liberty. The Emancipated captive passed largely unseen for more than a century, and its hollow narrative of White altruism likewise passed unexamined (the exception was Freeman HM Murray’s prescient 1916 study Emancipation and the Freed in American Sculpture: A Study in Interpretation [pages 120-128]). Yet the statue’s 19th-century racial aesthetics conflict with most contemporary perceptions of Black subjectivity, and some audiences resisted immortalizing those conventions and the racist privileges the monument has effectively condoned for a century. On the surface the debate over Wilson’s proposal revolved around acrimony over stale ideological motifs and whether such representations of African America can frame productive conversation about African-American heritage. Perhaps the most critical dimension of this discussion, though, is how materially illuminating race reveals deep-seated sentiments about racial subjectivity. From the most quotidian commodities to the most monumental materiality, racial privilege is silently reproduced, masked, and accented by materiality that appears to have no tangible connection to the color line. The reception to the freedman’s re-casting underscores the complicated ways such representations are contested in the contemporary world. The Peace sculptural grouping with the kneeling captive at lower right. The Soldiers and Sailors Monument was typical of later 19th century statuary that aspired to celebrate the mostly anonymous soldiers preserving the Union. 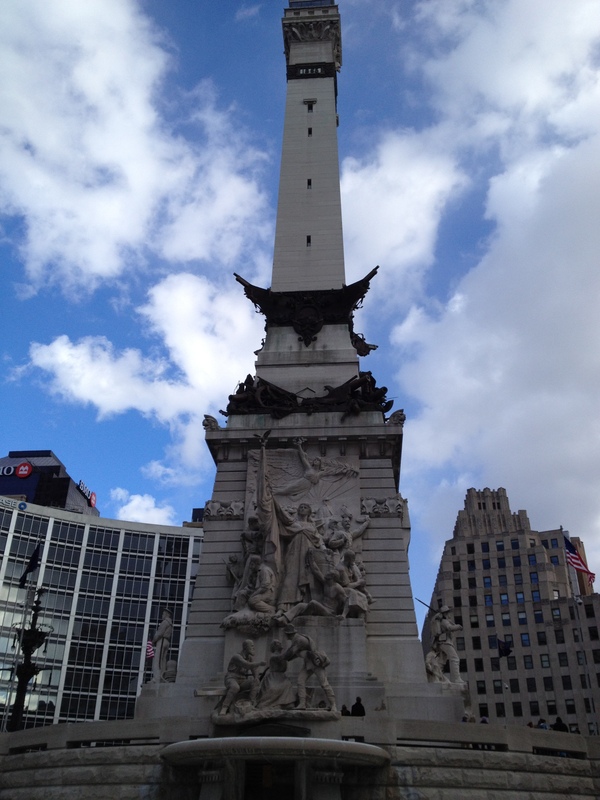 At the monument’s dedication in 1902, the Indianapolis News underscored that selfless service to the state was the central lesson of the monument, which demonstrated that “Private and general are entitled to the same measure of our love and gratitude if they do what they are bidden to do without thought of self. There is now no man so humble but he can greatly serve the country.” The 1902 speeches and newspaper articles on the Monument apparently said nothing about the relationship between the war and Black freedom. Fred Wilson’s work “re-purposes” symbols and things to compel audiences to rethink or simply acknowledge their meanings, so the unshackled monument captive provided a potentially productive motif to trigger a discussion about freedom, privilege, and the color line (see Wilson’s own framing of the project on the Indianapolis Cultural Trail page). In 2009 and 2010 the Cultural Trail planners shared their vision of this and other works in a series of public meetings. Tyler Green’s thorough and thoughtful coverage of the project in Modern Art Notes acknowledged that the planners “held a series of meetings to try to introduce Wilson and E Pluribus Unum to the community. Art students showed up and maybe a few other folks did too. The groups that Wilson and the ICT most wanted to engage — the quarter of Indianapolis residents who are African-American—were mostly disinterested.” Green certainly mis-characterizes those absences as “disinterest,” but his depiction of conventional “community meetings” that gathered together the “arts community” is clearly spot-on (compare Studio 360). Deep-seated mistrust of the state and a sober realism about the limits of Black community voices likely kept all but the most committed stakeholders from initial public meetings that have not often included voices of color. 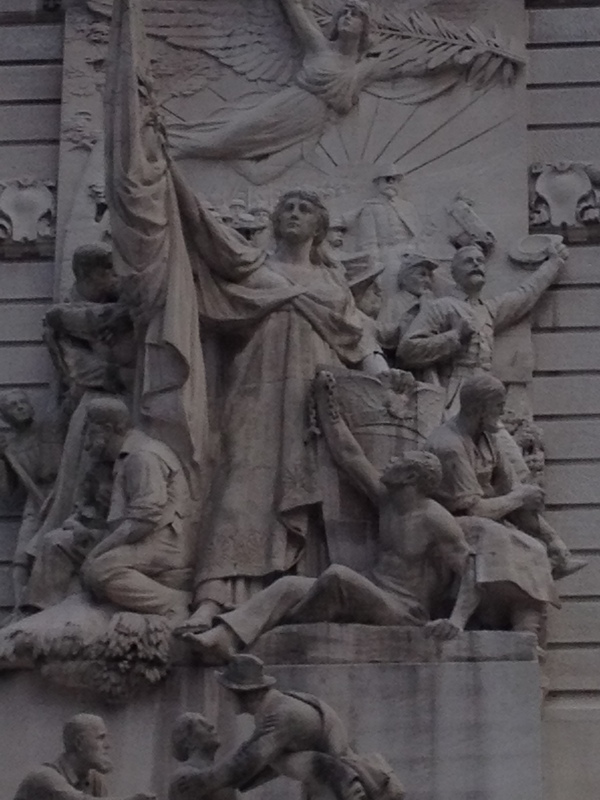 Close-up of the Peace grouping, with the emancipated captive looking up at Freedom. A rendering of Wilson’s proposed E Pluribus Unum sculpture. Fred Wilson’s Indianapolis sculpture raises the issue of exactly how we see race in materiality, and historically Americans have chosen not to see it at all. Wilson’s design intentionally appropriated an ideologically charged racialized symbol, but, as Wilson recognized, the precise discussion it hoped to foster when installed is not mediated by the state, socially powerful collectives in the city, an arts community, or any other social group. A reflective public discussion of race and privilege has historically failed Americans for half a millennium, but discussions about racial representation occur constantly in African America in secluded discursive spaces that rarely so forcefully find their way into public space. Tyler Green’s prescient Modern Art News analysis of the Wilson sculpture’s reception concludes that the reception “is the kind of artist-public discourse wherein art can play an important role as a community protagonist.” These discussions about African-American heritage have always been at the heart of African-American discourse, so the “arts community” has awkwardly found its way into that discussion and risks appearing self-congratulatory about initiating it. In a city that has often sought contrived racial consensus, some people saw the disputed statue as an unacceptably inflammatory illumination of the color line and African-American heritage. 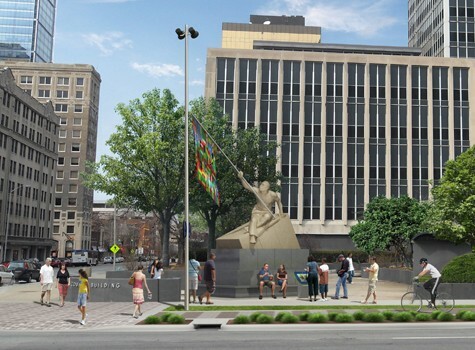 Tyler Green lamented that eliminating the statue from the Cultural Trail would yield “a false unanimity,” but in July, 2011 the Central Indiana Community Foundation announced that it no longer supported placing the statue in front of the City-County Building. Their inelegant retreat focused on the sculpture’s position at the City-County Building, which is home to the city jail as well as the Mayor’s Office, a space Wilson chose in part because it was within sight of the Soldiers and Sailors Monument. In December, 2011, the project was entirely scrapped. Wilson aspired to do much as Murray hoped by illuminating an otherwise invisible racial symbol hidden in plain view. Wilson’s re-imagination of that symbol will not become a concrete material reality, but the contestation of the freedman’s representation of race and African diasporan heritage demonstrates the genuine power of materialities of the color line. Admitting racialized symbolism challenges communities along and across color lines, and material culture—even the mere specter of material representations of African America like Fred Wilson’s sculpture—can foster productive conversations about the sway of race and racism.